If I hadn't argued with my best friend, I'd never have been struck by lightening. But if I hadn't been struck by lightening, I'd never have got my superpowers. I used to be plain old ordinary Holly . . . but now I've become EXTRAordinary Holly! Being struck by lightning and getting an amazing superpower wasn't how Holly thought that her day would go. But now it's happened, she might as well make the most of it . . . if only she could work out how to stop blowing everything up! Wow! So this is what happens when you combine a book with a comic. You get an explosive adventure that is so easy to read, you can easily finish it in a couple of hours. This is perfect for reluctant readers and I think the covers will make it appeal to boys and girls. I want to see more books like this! I really think more Middle Grade books should have pictures in. In fact, I'd happily read an adult book with illustrations. Just because I can read, doesn't mean I don't appreciate excellent drawings too. Although aimed at the Middle Grade audience, it deals with the role of technology and social media in today's society and shows how it is filtering quite quickly down to the next age group. We've seen a rise of social media appearing in Young Adult books, so it's not surprising and quite refreshing to see it reaching the 9 to 12 year old bracket, who are already using it as well. I love the main character, Holly. 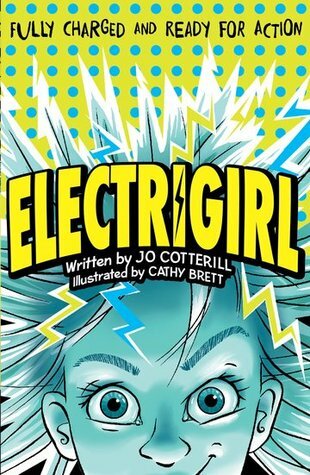 She is the most unlikely super hero, yet with the help of her super hero mad younger brother, Joe, she gets to grips with her new power. I'm so pleased to see a girl as the superhero and taking the main role in the book and Macavity makes a superb essential villain too. Jo Cotterill and Cathy Brett make the perfect team as they both bring Holly's story to life. I really hope this is a long running series. "When you start out, it’s difficult not to get sidetracked with all the things that need to be done for a new blog – designing, creating, writing, promotion (and that’s excluding social media). As you say, Kara, the need for money is a great driver for focus. But nobody should play the martyr. Better to get a job that takes financial worries away, and focus on producing quality work.